I am sucker for crumb cakes. The Starbucks coffee cake was once my favourite in my university days. It’s been a while since I made my last coffee cake that I almost forgot how much I love moist sour cream cakes with a crunchy crumb topping. The start of spring is always so exciting, with richly coloured rhubarb welcoming all the fruits to come throughout the warmer months. This year I wanted to create something simple and indulgent with rhubarb. 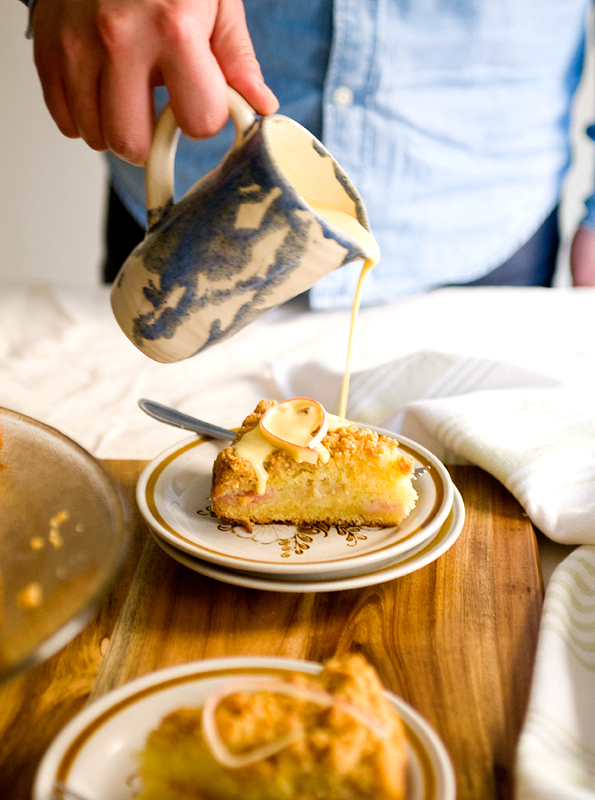 Creamy vanilla custard poured over a freshly baked rhubarb coffee cake? Yes, please. How can I resist another helping? 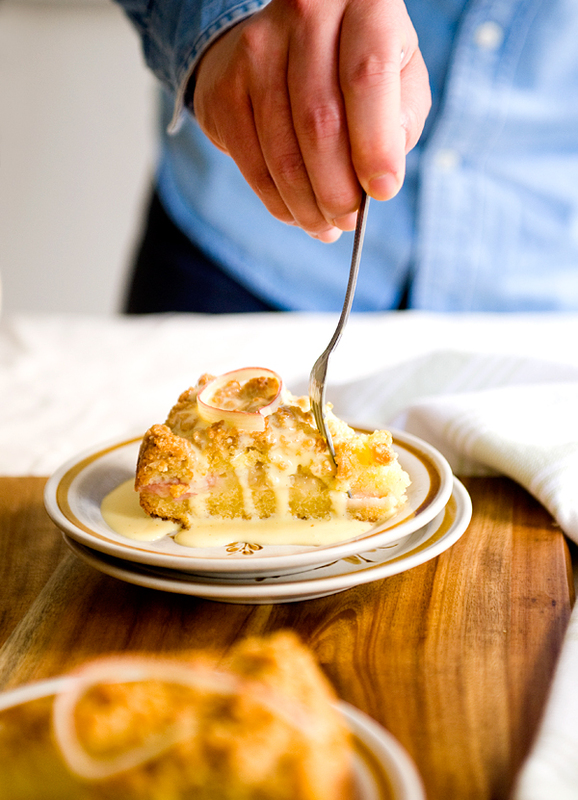 This rhubarb coffee cake with crème anglaise can easily be one of my favourite things I have baked this year so far. In a medium saucepan, heat vanilla seeds with milk. In medium bowl, whisk sugar and egg yolks together until it becomes pale. When the milk reaches a simmer, pour in half of the milk into the egg yolks while constantly whisking. Return the yolk and milk mixture in the saucepan and cook on low heat. Constantly stirring with a wooden spoon, cook the custard for about 8 minutes, or until it coats the back of the spoon (185 F / 85 C). Strain into a clean container and chill until ready to serve. In a medium saucepan, combine water, sugar, vanilla husks, and lemon peel to a boil. Put in rhubarb pieces, turn off heat and cover to the let the rhubarb steep until it cools down. This way the rhubarb pieces will maintain its shape and stay intact. In a medium bowl, combine all ingredients with your hands, break the crumble into pea-sized pieces. Chill in the fridge until ready to use. Preheat oven to 350 F / 175 C. Butter a 9 inch round springform pan and line the bottom and sides with parchment paper. In a medium bowl, whisk together eggs, sour cream, and vanilla extract. In a separate bow, whisk together flour, baking powder, baking soda, and salt. In the bowl of a mixer with the paddle attachment, beat butter and sugar until it is light and fluffy on medium speed. Add the half of the sour cream mixture into the butter, mix well on medium speed, add half of the flour mix, blend until there is no traces of dryness. Blend in the rest of the sour cream, and then the flour just until the ingredients have incorporated. Pour half of the cake batter into the prepare cake pan. Drain poached rhubarb, arrange an even layer on top of the batter. Scoop the rest of the batter on top, spread to level off. Bake in preheated oven for 35 minutes. Take out and quickly sprinkle an even layer of the almond crumble on top. Return cake to the oven and bake for another 30 - 35 minutes, until a cake tester comes out clean, or when lightly pressed in the centre, it springs back. When finished baking, take the cake out, cool on a rack for about 10 minutes before unmoulding. Cool and serve with the chilled crème anglaise. This cake is delicious on its own, the tartness and the luscious texture of the poached rhubarb is perfect with the sweet and moist cake with a slight tang from the sour cream. 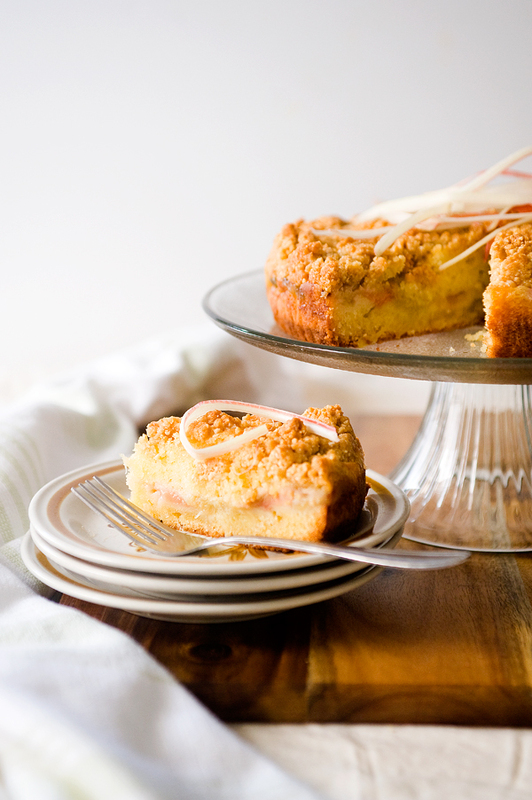 A crunchy almond crumb topping, cake, and a rich custard? I need a moment in coffee cake heaven. What seem like an ordinary crumb cake is made extraordinary with crème anglaise. Go ahead and treat yourself this spring because you finally made it through winter! Ha! I think you’d love this one! Hello, what are the flour measurements for your recipe? I think you forgot to add it. I just checked, the flour measurements are there. I’ve reorganized the order, hope that helps?